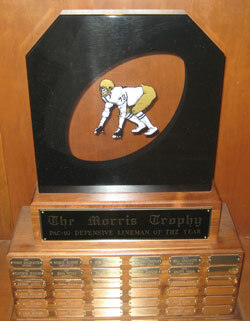 In 1980 Traci Lee Morris, then married to a University of Washington offensive tackled named Joe Sanford, had an idea for a trophy to give to the outstanding offensive lineman in the Pac-10. She wanted it to become as big as the Outland Trophy is for national recognition. It was her idea to have players vote for the best opponent they faced in the trenches. She mentioned that the media always picked the players that were promoted by the Sports Information department at each school, rather than those that were truly the most talented. Traci took the idea to Don James, Head Football Coach at the University of Washington who sent her to Mike Lude, the school’s Athletic Director who solicited support from other Directors of Athletics in the Conference. James recommended that she include the defensive linemen in the award as well as it would give better exposure and get more people on board. He also recommended that she include the coaches in the nominating process. Traci then worked on her Dad, Pat Morris, who was a big booster for the Huskies to sponsor the award. That is how it got its name, The Morris Trophy. Later that Spring, Traci met with all 10 Pac-10 coaches. The coaches supported the idea, and in the Fall in 1981 the first winners were selected.